The world of Dangerous Goods (DG) shipping is complex and ever-changing. For nearly 50 years, our goal at Labelmaster has been to help our clients navigate these evolving regulations so that every shipment arrives safely, compliantly, and on time. Education has always played a major part in achieving that goal, which is why we're proud to present the Dangerous Goods Report. 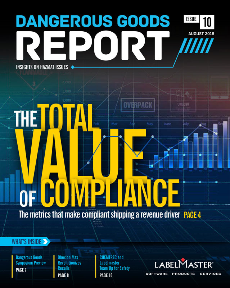 The Total Value of Compliance - The metrics that make compliant shipping a revenue driver. The most forward-thinking organizations, no matter what industry they are in, succeed by turning every segment of their business into a revenue driver. In the global supply chain, the top organizations make Dangerous Goods compliance a revenue-positive growth engine. This issue of the Dangerous Goods Report introduces total value of compliance. We'll also examine how advanced packaging technology simplifies the transport of damaged, defective, or recalled lithium batteries and battery devices, and look at the safety considerations driving our new partnership with CHEMTREC®. Can Packaging Innovation Make Battery Shipping Simple Again? This issue of the Dangerous Goods Report looks at an innovation that may change how we transport lithium batteries and battery devices, despite all the safety and regulatory hurdles involved. We also assess the unique challenges facing seven industries that ship Dangerous Goods, and take a closer look at the best ways to document hazmat training. We’ll recap last month’s Dangerous Goods Symposium, revisit our company’s 50-year history, and review the eye-opening findings of our first-ever international DG compliance survey. Dangerous Goods compliance isn't just about choosing the right labels, placards, and packaging. It's also about making sure everyone on your team has the training to make those choices correctly. 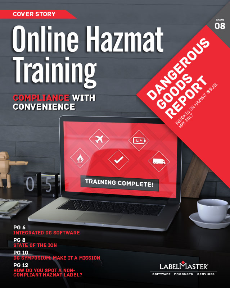 This issue of the Dangerous Goods Report looks at the often stress-inducing process of ensuring hazmat training compliance and the pros and cons of online training solutions. We also examine the benefits of integrating DG software with your ERP system, and take a looks at a new packaging technology that may soon revolutionize how lithium batteries are shipped. After a preview of next September's Dangerous Goods Symposium, you'll have a change to test you label compliance acumen. 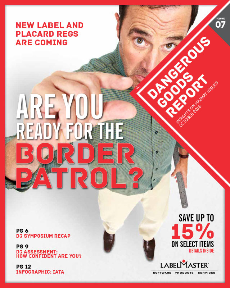 New Label and Placard Regs are Coming - Are You Ready for the Border Patrol? Dangerous goods compliance is about nailing the details — even when those details seem trivial. The better you handle the details, the more confident you can be in your operations's safety and efficiency. In this issue of the Dangerous Goods Report, you'll examine the new HM-215 regulations down to the millimeter. You can also take our DG Confidence Assessment to see how your company stands up to the competition in compliance processes and automation. You'll get a sneak preview of all the new 2017 IATA amendments for dangerous goods air transport, and revisit some of the sharpest insights and strongest opinions from September's Dangerous Goods Symposium. Dangerous goods require special labels, markings, and packaging instructions - but the most important element in keeping DG shipments safe might be the packaging itself. 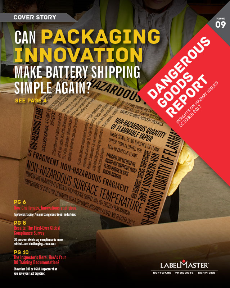 In this issue of the Dangerous Goods Report, we examine packaging inside and out - including a close look at the how and why of selecting the proper lithium battery packaging. We also examine how businesses have complied with the final GHS deadline and take a closer look at everything that goes into the perfect hazmat label. Finally our new infographic helps you sort out the nuts and bolts of the new reverse logistics regulations. Businesses that ship lithium batteries—especially retailers—had a challenging 2015, and 2016 looks to bring more of the same. Where can they find answers? This issue of the Dangerous Goods Report recaps the changes in lithium battery shipping regulations since last summer, and includes solid suggestions from our in-the-trenches experts. We also explore the purpose and properties of UN packaging and take a closer look at anti-static drum labels and security seals. And our new infographic asks the unlikely question: What if the 12 signs of the Zodiac were replaced by nine hazmat classes? 2015 was one of those years when Dangerous Goods regulations seemed to change too often for many professionals to keep up. But we did our best! From Lithium batteries to GHS to crude oil by rail, we worked with our customers to sort through all the new regulations and restrictions, helping keep their shipments compliant and the public safe. 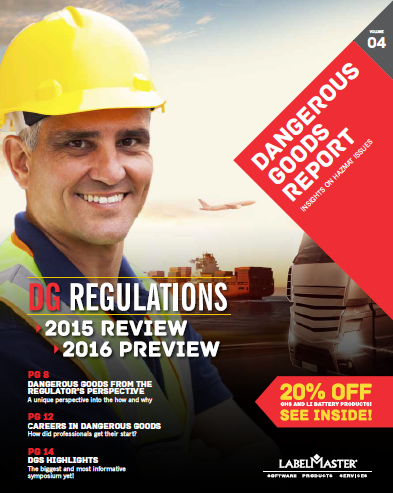 We've dedicated this issue of the Dangerous Goods Report to reviewing the impact of the DG regulations over the past year — and looking ahead to 2016. Safety is the heart of the Dangerous Goods business. All the regulations, guidelines, tools, and resources we deal with every day at Labelmaster are — ultimately &mdash about making the world a safer place. That's why we're excited about the upcoming 2016 Emergency Response Guidebook. The ERG is the ultimate public safety resource, and we want to make sure everyone involved in the handling of transport of Dangerous goods has a copy — and knows how to use it. 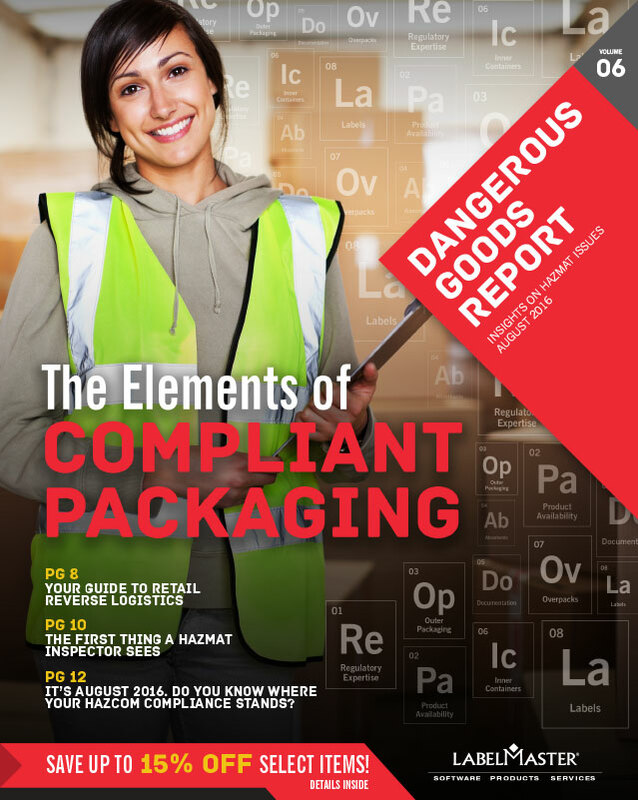 In this issue of the Dangerous Goods Report, we take a look at an initiative to adopt international standards for hazard communication to help facilitate international trade — OSHA's 2012 Hazard Communication Standard, which seeks to align workplace hazcom in the U.S. with the Globally Harmonized System (GHS). Ready for the New Regulations! 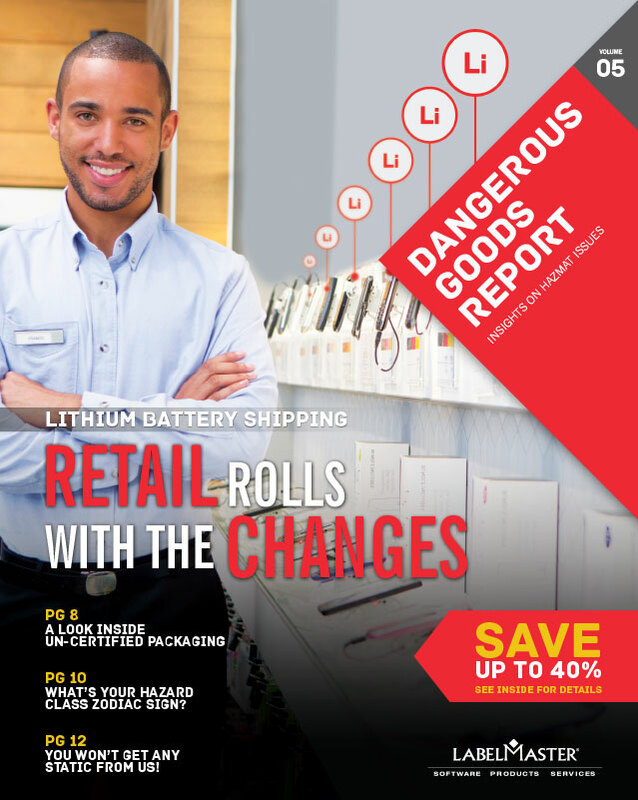 In this issue, we take a look at the changing regulations regarding shipping lithium batteries. While lithium batteries have delivered superior performance and reliability in an endless array of applications, the same technology that makes them so useful also presents unique hazards for shippers, carriers, and receivers. Several significant incidents involving fires in both cargo and passenger aircraft have been attributed to shipments of lithium batteries. As a result, regulations in the U.S. and around the world are being revised to enhance the safe transportation of lithium batteries. Labelmaster's Dangerous Goods Reports are designed to provide accurate information regarding the subject matter covered. Every effort has been made to provide a simplified guide consistent with the various applicable regulations. However, if there is a discrepancy, the regulations are the final authority.